Even if you don’t like sweet potatoes, you should try these. If you still aren’t a fan, then you probably really don’t like them. I used to run from “Sweet Potato” anything, but I learned the secret to hiding the icky and bringing out the yum! In the last six months or so, Mr. Napping and I have eaten at Outback Steakhouse a couple times. Usually, I’ll get a steak and some coconut shrimp, but always, ALWAYS, I get the sweet potato fries. They are so delish! But I can’t afford $25-30 for a handful of sweet potato fries, even if it does come with a yummy steak and shrimp. It took some trial and error, but I think I finally figured out how to get that scrumptious sweet potato fry right from my own oven. Cut the potato into long skinny strips. Mix the ingredients for the seasoning mix in a container, one with an air tight lid. Dip the potatoes in the water and shake off any excess. Drop the potatoes into the seasoning mix, put the lid on and shake until all the potatoes are well-coated. Spray a large baking sheet with the olive oil (don't saturate the pan, but coat it well) and lay the seasoned potatoes on the pan, in a single layer, not touching each other. Bake for 5-7 minutes and then flip the fries and bake for another 5-7 minutes. Let cool. Lightly drizzle with honey, if desired. And I mean super lightly, just barely enough to taste. *Toss any extra seasonings. It's not much. Besides, the sugars clump, the flour dissolves and it's more mess the second time around with leftover seasonings. It's not worth it. That's actually why some of my fries are a little scorched, there wasn't enough flour in some leftover seasoning and the sugars scorched. It didn't taste bad, but my pans were a tragic mess. I had to let them soak for two days before I got everything off. Usually it's not big deal to clean them. So, be warned. You can save them, but add extra flour before you use it again to prevent the burnt sugar. Mix together in a small dish. I’m done with the recipe, but if you’re up for some story time, sit tight. Like I mentioned before, these are worth a try even if you don’t like sweet potatoes. When I was little, my mom made sweet potatoes with marshmallows for dinner one night. Oh, my gag. Yuck. Each of my siblings and I were given a spoonful and told we couldn’t get down from the table until it was gone. We sat there for, I kid you not, four hours. At that point the deal was changed to three bites and straight to bed (it was like 10pm at that point). Oh, it was awful. The most disgusting three bites of anything I have ever eaten. And I refused to eat anything with any semblance of sweet potatoes or yams, regardless of the prep method. Blech! And then Mr Napping ordered the Outback fries and I ate almost his whole plate. 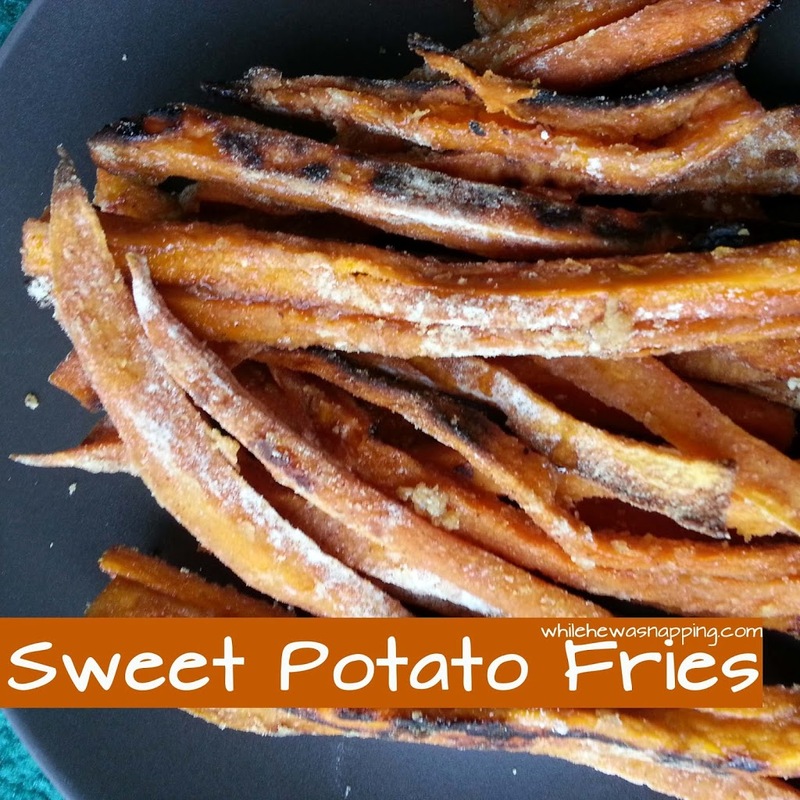 I still won’t touch candied yams, but this fry version is to die for. I can’t get my head around sweet potatoes with marshmallows. Never tried it as it’s not really something you find in the UK but it just feels wrong to me. I do however love sweet potato chips. I always eat too many when they are on the table.